This is a dated ramble about migrating the site from Squarespace to a self-hosted WordPress, so here is the crux. The Appademic was initially hosted on Squarespace, which made it easy to setup quickly and relatively simple to run. However, it didn't take long to become frustrated with the platform. Ultimately, moving to a self-hosted WordPress site gave the site the kind of flexibility Squarespace cannot match. 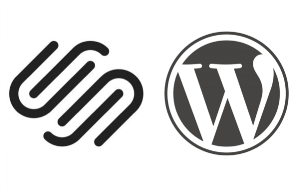 Squarespace is fine if your needs are simple, but you can do so much more with WordPress. This site is now built with the wonderfully designed, easy to use GeneratePress theme – and is hosted with CloudWays. Despite the Squarespace pitch it is just as simple to run, and much cheaper. Also, I can do what I like with it. Squarespace is Quick and Easy, Right? This site was initially built with Squarespace, which is a fine platform for any number of use cases. The advantages of using Squarespace are obvious, it is quick and easy to build a site, the templates are visually appealing, and you don’t need to concern yourself with scaling hosting for spikes in traffic. I have been reasonably happy with Squarespace, for starting out. Something that comes with the territory, however, is learning certain things about your preferred workflow. As you start to develop your blogging style, you are more likely to pick up on shortcomings in the tools at your disposal. As I get further into this, there are some examples for the way that I work – or rather the way that I wish to work – that are starting to get in the way. The first, and probably the biggest annoyance – I write in Markdown. While it is possible to use Markdown with Squarespace, the service only supports a very basic implementation, which means adding simple things like footnotes  requires both implementing awkward hacks, and converting your posts to HTML before adding them to the site. Both of which undermine one of the platforms major selling point – i.e., ease of use. Further awkwardness is encountered when working with images in your posts. Squarespace has its own content delivery network (CDN), which for the most part is great, but in some cases it is another double edged sword. The CDN takes care of compression, and makes the media assets of your site load easily, regardless of where your audience is. However, working with Markdown or HTML on Squarespace you lose some of the benefits of those formats when working with images. Essentially, you have to leave the images out of your composition and load them separately, and the file management is by far the poorest feature of the platform. If you want to use the Squarespace editor and work with images in the manner that the platform is designed form, then it is great. Unfortunately, that doesn’t suit my workflow at all. What I am left with is a fiddly process of uploading images after the text, and dragging them into place. This might not sound too bad, but the reality is a degree of trial and error that can be frustrating. Dropping the images into the post splits up the text  in separate blocks, which don’t always line up the way you want them to. Often I have to adjust the wording of the post to make the image sit right. Or I can use another workaround by inserting what Squarespace calls a spacer, but that results in excessive white space through the post. There is more, the Squarespace interface shifts your whole site top the right to accomodate its sidebar as you edit design elements. This may well be a by-product of the template that I use, but something to be aware of, you can get things looking the way you want them, only to have them move out of place again when you leave the style editor. Delivering mixed content blog posts is one thing, but the most vexing side-effect of that is the way it pushes me to do so much of my work for this site on my Mac. Don’t get me wrong, I love working on the Mac, but these days I am doing more and more serious work on the iPad Pro, and I want to be able to manage the site on the go. Sure enough, Squarespace has an app for creating and managing your posts on an iPad, but it has some bothersome problems. First, the images problem is made worse by the fact that the app considers those mixed content posts to have complex layouts. If you edit posts that have images placed alongside or wrapped by text, it will collapse their layout so the images are at best inserted between paragraphs – the images are then increased in size to fit the margins. The app will warn you before doing this, but if it happens you have little choice but to return to the Mac. You can of course access the web editor on the iPad, but it is designed for precision use with a mouse, so you are asking for trouble trying to use it with a touch interface. Unlike WordPress, there is no longer a posting API for Squarespace, meaning the only way you can use a third-party editor for composing your blog posts is cut and paste. This applies to working on macOS just as much as it does to iOS, but it provides nothing like the same degree of difficulty. 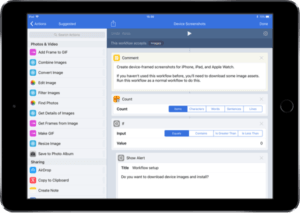 Crafting a Workflow, or a similar process in Editorial or 1Writer on the iPad will allow you to manage the Markdown to HTML problem, but the app’s integration with the iOS share sheet is poor, so you are still left with cut and paste at the end of it – and that is before you get to the images. It is true that you can just simplify things, and working with simple layouts in the app does work well enough. There are design elements on Squarespace that are dependant on the site template, but even when available might not work very well. The nature of The Appademic, as a site for bringing together tech and education, lends itself to link posts. I have separated them out from the main blog, as I’m not a big fan of sites dominated by link rolls . Unfortunately, the template that I use doesn’t render block in a sensible way – there is no indentation, for example. This leaves me with another awkward workaround, among the bad options for this I have landed on adding a rich text block, but this adds yet more layout complexity – and to posts that should be the simplest of all. There is much to like about squarespace. The visual design aspect is pleasing, one thing I have been very happy with is the way the site looks. It took no time at all to get everything setup. For photography sites, the CDN, and template the gallery designs make for one of the best experiences going around. This site, however, is not a photography blog. Neither is it a store front, another area that Squarespace excels in. Squarespace also gets a hard time about search engine optimisation, which I would urge you to take with a grain of salt due to the army of affiliate marketers working on WordPress selling would be bloggers on themes, plugins, and all manner of other snake oil to ‘make it rain’. The free source and extensible architecture of WordPress is its biggest strength, but it also opens it up to the current zeitgeist of internet sharks. Having said that, I do have a genuine problem on Squarespace in that my use of Markdown and HTML seems to create errors in the data that Google and other search engines index . If you are going to use the platform in the way it was designed – composing and posting with rich text, using a simple structure, and so on – you will not encounter the same problems. If you are an edge case for the way you work, like it appears I am with this site, it is worth considering how this might affect your discoverability . The other side of that equation is that you are more likely to have readers stick around if they land on a slick looking site than if they find a dog’s breakfast on the end of those search results. Squarespace is not going to let you down in that regard. But more than that, Squarespace is in some sense a set and forget situation, you don’t have to concern yourself with more moving parts — there is hosting to manage, so you don’t have to deal a server. You don’t even have to go outside the platform for your domain management, everything is self contained within Squarespace. These are compelling selling points for the service. Again, be wary of affiliate marketers when choosing between WordPress and Squarespace, while WordPress is not difficult to use or to learn, it still takes time to master, and to my mind not only will Squarespace will get you up and running a lot quicker, but nobody is getting a cut to tell you that . Why post any of this? Well, the workaround I mention above have created enough friction for me that I have made the decision to migrate to a self-hosted WordPress installation before the site gets too big to contemplate that. The main reason is the workflow, I need the flexibility that WordPress can offer for working with Markdown, and on iOS. If you have made it this far through this post, you can probably tell it hasn’t been an easy decision – even now I have my doubts. This site is paid in full for another six months on Squarespace, which is another reason to not take this decision lightly. As I have gone back and forth, reading innumerable frustrating and vapid articles, sifting through the noise of resellers, affiliates, hosting companies and self-appointed gurus, I have continually come back to the one thing that matters to me most in this, my ability to work in the way that I want to. Ultimately, The Appademic is a site about doing your best work – whether as an academic, a student, or any kind of creative nerd – and I feel it is bordering on disingenuous to be writing about that via a means that contradicts the message. I looked seriously at static engines, particularly Jekyll, which is not only a brilliant solution, but is perfectly adaptable for mobile use. Inevitably I settled on WordPress for the flexibility and better ability to eventually open out the site to other writers. The Appademic will still operate as usual for the moment, as I clone it and test it elsewhere. However, any content going up in the next few days will be basic by necessity. There are bound to be mistakes, although I am working hard to mitigate them. If you happen to find any, please contact me to let me know. I will post an update on the other side to report on how it all went, but it should be obvious when the site design changes that the switch has been made. In December 2016, I announced that I’d no longer be updating Workflow Directory. The Workflow team had made some great improvements to the gallery, the biggest of which was user submissions. At the time, it didn’t make sense to continue working on the site when the built-in feature was so much better. Fast forward to March 2017 and the news broke that Apple had acquired Workflow. While the app continues to be updated, the gallery is not accepting user submissions. Since then, I had often wondered if it’d make sense to reopen Workflow Directory. So I’ve decided to do just that, but in the process I’ve made a fundamental change. After testing the waters last week with a similar endeavor, Workflow Directory into a GitHub repository. Existing workflows have been migrated (with the exception of a few that are non-functional) and I’ve added a few new ones too. Each workflow has an accompanying README containing a description. Workflow remains a glaring gap on this site. To be fair, I’ve not been at this too long, but the real reason is the art to doing the app justice. There are some ingenious users around creating incredibly inventive workflows. By way of qualification for the link to Jordan Merrick.com consider that every image posted on this site that is framed with an iPad or iPhone mockup has been created with either this Workflow, or its predecessor. Not only is it one of the best uses of the app I have come across, but it has saved me epic amounts of time. There has been a lot of conjecture around the future of the Workflow app, but not only has the app continued to receive updates, the signs are good for some form of future integration into iOS [^ Perhaps even beyond, one can only hope]. The design language of visual automation hits the sweet spot between the über nerd and curious tinkerer, lowering the bar for entry by a remarkable degree. If you are worried that you might pour a lot of energy into something that is fated to disappear, I truly doubt that will happen in such a way that will render your learnings obsolete. The visual programming paradigm that has its roots in Automator has been so well refined for touch interaction by Workflow, that it is here to stay in one form or another. 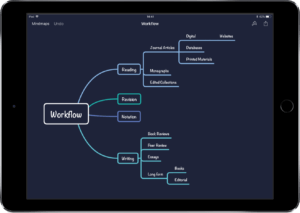 On the flip side, with initiatives like the Workflow Directory, if you swish to do so, you can get a fair amount of mileage out of the app without building any workflows of your own, or at least by adapting some to your own purposes. Of course, if you already have the chops, there is plenty of karma to be gained by pitching in to the directory with a contribution. I have been impressed by Lighten. One would expect the folks at Xmind know what they are doing, but honestly that doesn't always result in a decent mobile experience. Lighten is, as the name hints, a lightweight mind mapping app. It has simple feature set, but is a nice looking app with an intuitive workflow. 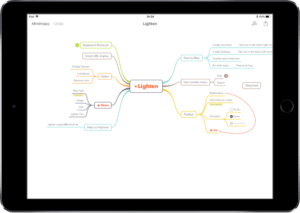 For anyone looking to get into mind mapping on the iPad without fronting the expense for one of the more feature rich apps like MindNode or iThoughts, Lighten is a really good option. At the moment, with a back to school special still running, Lighten will set you back US$0.99. That is a serious bargain. The one notable omission at this point is the inability to export to OPML, but there are still a range of export formats that should make that a moot point or all but the most steadfast workflows, and I would suggest that anyone with such a rigid mind mapping regime will probably be well past a gateway drug like Lighten One woudl expect the folks at Xmind. You can export to a Text file, Markdown, image, PDF, and of course both Xmind and Lighten file formats. Most mind mapping apps will parse the map successfully from one of those formats, and converting a mind map to an outline can be done with either Text or Markdown. I tested the transfer between Lighten and MindNode in a silly variety of ways and every time the mind map came out looking just like the cruft that made it from my mind to the so-called map. If you are looking for a simple, aesthetically pleasing, and competent app to start mind mapping with, I suggest you take a look at Lighten. Xmind have not only done a good job with the app to date, but judging by the release notes the app is a going concern that will continue to receive love and attention. There might come a time that the 99 cents you put down here pays you back tenfold. Setapp shows no sign of slowing down, as it adds more quality apps and essentail services. Not that long ago, powerful FTP client and Finder alternative Forklift was added to the stable. For science students and researchers, they have added the wonderfully designed digital lab book Findings, and I recently mentioned the addition of 2Do. In the past couple of days Setapp have announced the addition of third-party Gmail client Boxy. These are all excellent additions to an already compelling service, but the development that I find most pleasing is the service being translated into Spanish. Not only is this a boon for the Mac users among the more than 400 million Spanish speakers worldwide, but it is a sure sign that Setapp is here for the long haul. If you haven't already checked it out, you have nothing to lose, there is a 30-day trial — no credit card required. If you decide to roll with it from there, you can either pay US$10 per month, or grab the educational discount by paying US$60 annually. With the growing trend toward subscriptions, this is starting to look like a serious bargain. It is getting harder to see where the gaps are in the collection for education users, unless you are wedded to mainstream giants for your work, like MS Office. The one obvious omission at this point is citation management. Otherwise, from mind mapping to timeline generation, your choice of world class text editors, and the dedicated Studies App, it is safe to say they have you pretty well covered. To be clear, I'm not affiliated with Setapp in any way, this is genuine enthusiasm for an approach to the app market that I feel is promising for everyone. I have already written about the value of subscribing to Setapp, but the service just keeps getting better. The utility of this service for academic work should be hard to ignore for a lot of people, especially for students, considering the potential savings on apps you might only need for the duration of your studies. They recently added education pricing, and now they have added one of the very best task managers available to their impressive inventory. I have been a user of 2Do in the past, and wouldn’t hesitate to recommend it to anyone. It is easily the most flexible, and customisable task manager available, and has picked up something of a cult following in the past few years. 2Do is on of the most powerful task management apps available today. 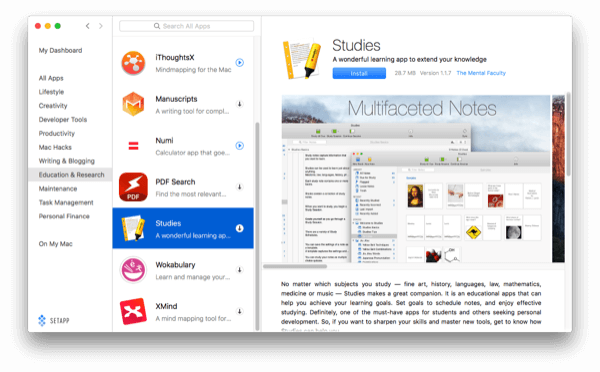 It is an ideal app for keeping the demands of study and research in order. The Mac Power Users Podcast had a show last week with Internet mad scientist Brett Terpstra on how to start using tags on macOS and iOS. This is something that I have only recently begun in earnest myself, but already I can see how beneficial it is. Whether you are a new student or a seasoned researcher, this is something I cannot recommend strongly enough. Managing documents and files in a sane way can be the difference between meeting a deadline and losing a ridiculous amount of sleep at times. On the growing list of topics I intend to cover in detail is the indepensible automation app Workflow, which these days is owned by Apple. To dispell the ever-present rumours of Workflow's impending death, the latest in a steady schedule of updates has been released. This time focusing in on a long list of bugs with third-party app and API interactions. If you haven't already tried this incredible peice of software, the is no time like the present.